The Penn Senator is a classic beach shark fishing reel. This reel has landed some of the biggest sharks in landbased shark fishing history. 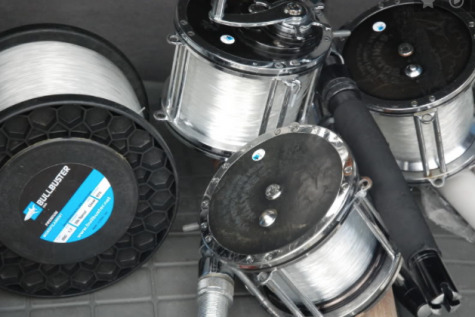 Some people start shark fishing with this reel and some quickly switch to it when they hook a shark that their 50 wide or spinning tackle is just no match for. Many modern shark fishermen have switched to high speed 80 wides, however there are still plenty of shark fishermen sticking to their roots catching 12 ft+ sharks with senators! You are going to need at least a 5Lb Spool Of either 125 Lb or 200 monofilament to spool your PENN 14/0 up completely. The Penn 14/0 has been in production for over 50 years with a number of different spools built into them. The estimated line capacity for ANY model of 14/0 is between 750 and 1000 yards of 125Lb Monofilament. With 200 Lb monofilament you are going to have between 600 and 800 yards depending on which model 14/0 you are working with. The best option is to spool your reels with about 500 yards of braided backing (130-200 Lb braid) and the put a topshot of monofilament. If you go 500 yards of 130 Lb braid you will end up with between 600 and 850 yards of 125 Lb monofilament. If you go with 500 yards of 200 Lb braided backing you will end up with between 400 and 600 yards of 200 Lb monofilament depending on what year your 14/0 was made. So Which Model 14/0 Has More Line Capacity? The newer 14/0's have more line capacity than the older models did. So if you are getting a brand new PENN 14/0 go with the higher end of the estimates on line capacity above. If you have an older Senator go with the lower estimates on line capacity. Is A PENN 117L A Penn 14/0 ?